You know what’s the best thing about getting into a series late on? Particularly a Netflix one? Not having to wait months for a new season! So…, yeah basically a month ago, I finally decided to make use of my Netflix subscription and watch some of the Netflix show that I have been meaning to watch but for some reason, I haven’t, and… among them there was Voltron! So… yeah, at the beginning I was a little unsure ’cause while I have been a huge fan of “kids series” like Phineas & Ferb, Star vs the Forces of Evil, Gravity Falls, Miraculous Lady Bug, etc., there have been some others that… have made me wonder what the heck are kids watching and learning these days -and man does that make me feel old-. But in the end… watching the promo and learning that some of the creative team behind The Legend of Korra were also behind this series… well I had to give it a chance. Last fall I made a list of all the shows that I wanted to see in 2016-2017, ´cause back then it was my intention to not only watch all of them but also review some. Needless to say that real life had other plans and now I can barely keep with all the things I want to read, watch and write, but… anyway. Anyway between all of these new shows, there was a little NBC comedy wich only had a 13 episode order this season and had Kristen Bell as it´s protagonist. Now I´m not a big Kristen Bell fan, I mean I know she did Ana´s voice in Frozen -I think- and that she was the lead on the fan favorite series Veronica Mars -which for some reason I never got to watch-, so… quite frankly the only reason why I decided to watch the series was because the trailer sold it to me. But I could have never imagined that The Good Place -the show mentioned- would become one of my favorites, my favorite comedy -so far-, and the one show that I couldn´t miss at all! Reasons to love The Good Place I´ve got plenty, ´cause yes, it´s just that good; but since this is already turning out to be a long post, I decided to just enlist some of the reasons why this is such a forking awesome show. Yes, I know. We´re basically halfway through February, and I´m just posting my book picks of the month; but since today is Valentine´s, I figured it was a good day as any to post the books that I intended to read this month. Last month, ´cause I knew I wouldn´t have that much time, I planned on reading only 3 books -I think-, but in the end, even that turned out to be too many, since Middlemarch turned out to be a way more difficult read than expected. Anyway, this month, I´m back to making things difficult for myself, since I have 4 books listed, and I´m still reading the first one -there are so many things to do!-, so… let´s see how things turn around this month. Christmas Books Caroling My Name! Christmas is here! Well, sort of…., I mean is December and Christmas is coming so since last month I made a list of all the books I wanted to read before November ended -which I did! by the way-, and I had previously pretty much abandoned this section of my blog, I decided to do it again. The only difference is that this time instead of reading monster´s and ghost´s stories, I decided to go for Christmas and winter stories because… Christmas? I mean, I don´t really like Christmas that much, but I also don´t hate the celebration. So, let´s just say it´s not that big of a deal for me, and that probably has something to do with my family life, but that´s something for another post. do something a little different and make a sort of book list per month -or 2 months-. I have sort of done something like this in my comic book posts, so… the rules to apply here will be kind of similar. And I know that October is almost over, but this just makes it more fun to see if at least I´ll manage to finish one book in a week, right? Be careful what you wish for, ´cause you might get it all. It might sound like a cliche, but honestly speaking I would bet that was what passed through Tarquin´s mind more than once through Tarquin Jenkins and The Book of Dreams, as it was pretty much the first thing that came to my mind after reading this book; one that once again I had the opportunity to read thanks to @Booktasters and the author himself. I´m really behind my reading but “Fred the vampire accoutant” won´t get out of my head! 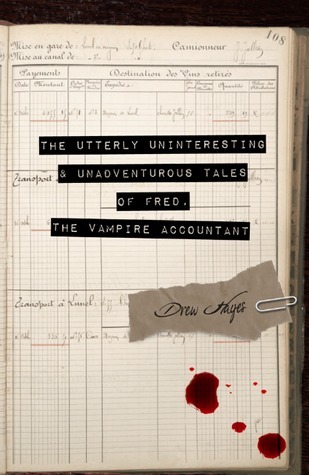 So… I have like 3 or 4 books to read yet, 2 of which I´m currently reading, but it´s kind of difficult to finish them when all I want to read is The utterly uninteresting and unadventurous tales of Fred, the vampire accountant by Drew Hayes. What´s worse, there´s even a sequel! Death and Taxes -doesn´t that sounds hillarious? !-, I really, really want to read this book, so much that even if I haven´t finish any of my other books, I have already order it! It´s just there, liying on my play book, tempting me, asking me to just click on it and start reading, promising me a fun ride, with the kind of stories I enjoy the most. Paranormal-fantasy novels and vampires, can´t forget the vampires! With the main protagonist as a timid, socially awkward and full of self-esteem issues vampire; how am I suppouse to resist?! I must resist! Have you ever been tempted by a book? what do you do to resist the temptation? Do you even try?